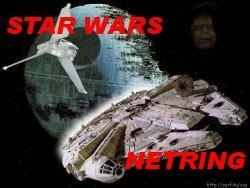 The "All Star Wars Sites WebRing" is for all Star Wars fans. The websites in this ring are about the blockbuster science fiction movies Star Wars, and have information, pictures, books, music, sounds, and custom images about Star Wars. If you have a webpage about any aspect of Star Wars, join today! If you have more than one, you may add all of them. The "navbar" navigation graphic for this "All Star Wars Sites WebRing" may be seen at the bottom of this page.